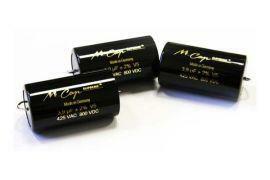 Mundorf MCap®SUPREME has been widely acclaimed as the ultimate high-end capacitor. The subtle ?ne gradation of the high tone range invigorates the entire sound production; voices and instruments take shape and become extremely diverse. The outstanding sound performance is achieved with a unique induction-free SUPREME winding technology.